I'm Dorothy Wills-Raftery, also know in the Blogger and Twitter world as FiveSibesMom! 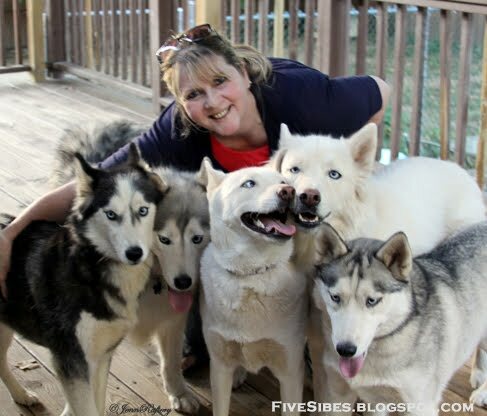 My daughter took this photo of me with our five Siberian Huskies - also known as the FiveSibes™ - out on our back deck. Pictured left to right are: Nanuk "Harley" Mari, 6, our alpha queen; "Gibson" Les Paul, 5, who is totally in love with Harley; and then there are Gibson's younger siblings, the 3-year-old pupsters "Chloe" VanWylde, Wolfgang's White "Wolf," and "Bandit" Esmeralda. 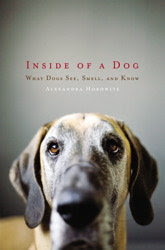 In addition to being a mom, I am an author, photojournalist, editor, photographer, and canine blogger. 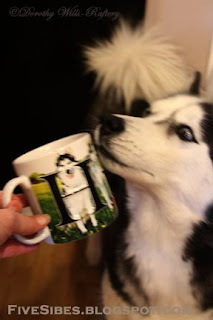 Our Huskies are my inspiration for my series of A FiveSibes™ Tale children's books, my FiveSibes™ blog, and the FiveSibes: Siberian Husky K9 News & Reviews community Facebook page. Every day we share breakfast time together. I really enjoy being out on my back deck with them and my coffee. A great mug of coffee with five furry babies all full of Husky hugs, woos, and lots of kisses is a great start to the day! Plus, right now we are having a bit of a celebration as this month is the pre-release of my first illustrated children's book in the series based on them titled, What's Wrong With Gibson? Learning About K-9 Epilepsy. It's based on when Gibson was first diagnosed with Canine Epilepsy. The story is told via text and fun illustrations in a manner that will appeal to the child in all of us. It also sends the message that while it can be scary, it's okay to have Epilepsy. Since Gibson in an Epi-dog, this cause is very near and dear to my heart. A percentage of the book's proceeds I will be donating to the non-profit center for Canine Epilepsy Resources. So we're all pretty excited about that and have been doing a bit of celebrating with coffee for me and dog treats for them! 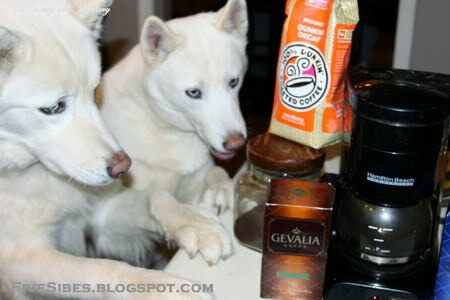 At home, I brew Gevalia and my very favorite blend is the decaf Mocha. 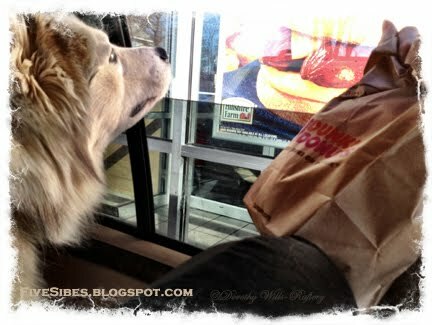 When out, it's only Dunkin' Donuts for me! Right now I'm hooked on their Pumpkin Lattes! With my AM coffee, I enjoy a nice yogurt parfait with granola and fresh fruit. The Huskies get their breakfast, which is kibble with plain organic yogurt and sometimes I will sprinkle dehydrated fish or Blue Buffalo fruit bars on top of it. Growing up, we always had a myriad of pets. There was never a time in my entire life that we did not have dogs. My daughter always wanted a Siberian Husky. When she was in high school, we let her pick her first one, Harley, out from a litter from a wonderful breeder. At the time, my Chelsey, a German Shepherd/Akita mix was elderly, so my husband thought Harley needed a frisky young playmate. Enter my boy Gibson who was four months old and came from a local breeder. Fast forward a couple years and the folks we got Gib from wound up owing our company money, so we asked for a puppy instead of the cash. When we got to the breeder' house to pick it out, we were shocked. Our hearts broke at the condition of their dirty and lonely surroundings and we wound up leaving with three (who were firmly grasped in our arms!) That was my first introduction to dealing with an uneducated, uncaring, selfish backyard breeder. Honestly, I have always felt that we rescued them. Just recently, we heard two from that litter wound up being surrendered to a shelter and the owner put down the mother Husky because she developed seizures. That broke my heart and reinforced how glad I was we had left with all three. I then started reading about Husky rescues. I think the folks who volunteer, foster, and help these homeless Huskies are just wonderful. I try to be involved and support them as much as I can now. Someday, I'd love to start a Husky rescue of my own. To think there are so many homeless ones out there who do not live the type of life I give to my Sibes, is very distressing to me. When I watch my Husky babies all huddle, play, sing, and sleep together everyday as a family, it truly warms my heart. My daughter, who is a musician by hobby, named most of them and her love of music shows in their names! And yes, they have plenty nicknames! Harley is strong and the leader of the pack. Her nicknames include Har-Har, Mama, The Queen, The Boo, Roo, Rooster & Gorgeous. Gibson, my big wooly boy, is named after the guitar. He is also Gib, Gibbie, Gibbers, G, & Mr. G., and Handsome. Wolf is named after a combo of Wolfgang VanHalen & Mozart, plus, he looks like an Arctic Wolf. We also call him Wolfie, Baby Boy, and Studs. Chloe's last name is after a combo of Zakk Wyldde and VanHalen and she goes by CoCo, Cozy, Coconuts, Sweetie, and Baby Girl. Bandit's name fits her to a "T" as she steals everything! We also call her Banda Bear, Beebers, B-Boz, Bandita, and Crazy Girl. They love to go for a walk anywhere on a leash, but they love to run free on the "play" side of our yard. All three...only they won't eat the postman. They all possess such phenomenal qualities - love, loyalty, devotion, understanding, playfulness, patience, intelligence...it would be hard to pick just one! Even the occasional bout of stubborness and destructive boredom is acceptable. It's what makes them who they are. And I love them for all their qualities. They would want me to take time to sing, play, sniff the air, splash in the mud, let snow fall on my face, smell the flowers, relax in a ray of sunshine, and greet each day as the gift it is. If Hollywood made a movie about your life in which your dogs could speak, who should do their voices? Harley - Angelina Jolie; Gibson - Peter Cullen; Wolf - Owen Wilson; Chloe - Amy Adams; and Bandit - Jenna von Oÿ. 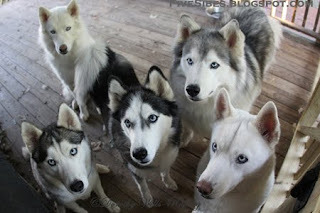 Visit the FiveSibes™ blog and the FiveSibes: Siberian Husky K9 News & Reviews community Facebook page. Hey - I know the Five Sibes Mom - and all the doggies - they have a cool blog and I learn so much from readin' it!! 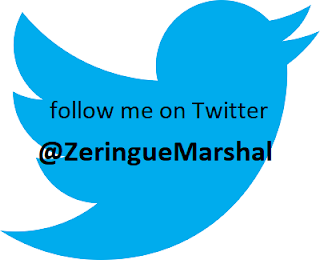 Thank you, Marshal, for inviting us! We had fun having a coffee break with you and are honored to be part of your "Coffee with a Canine" series! Wow, I love FiveSibes! Their blog is pawesome and they are wonderful furiends. Thanks for spotlighting them. Hi Five Sibes Mom! Knowing what a caring heart you have, I bet you will start your own Huskie rescue some day. We're furiends with the five Sibes, too! Great to read the interview, mom read it while drinking her Starbucks! Great interview... loved reading more about you guys! I especially enjoyed hearing who you think would voice each Sibe.